Overall views of China have remained largely steady in the past year. Currently, majorities or pluralities in 15 of 21 countries outside of China have a positive view of this rising Asian power. 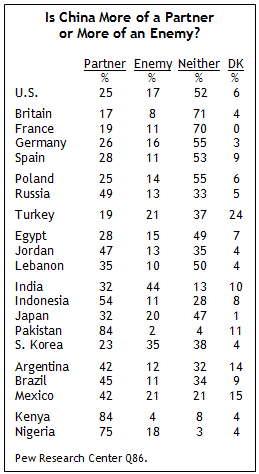 In addition, publics in most nations surveyed see China more as a partner than as an enemy. The survey also finds that the Chinese are overwhelmingly positive in their attitudes towards the U.S. Large majorities see an improvement in the relations between the two countries and characterize their interactions as cooperative. However, as most of Europe and the U.S. still face varying degrees of hardship resulting from the economic downturn, China’s accelerated growth continues to generate concerns about its economic power. Publics in most countries also believe that China’s military prowess is a bad thing for their country. 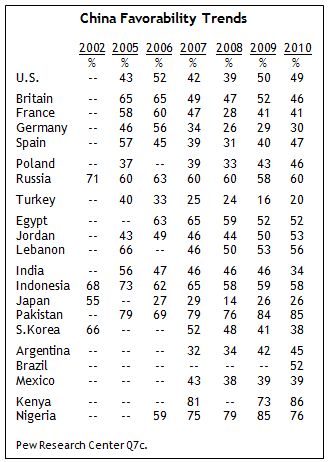 After a slight improvement in favorability ratings in 2009, views of China have held steady in most countries surveyed. In both the U.S. and Western Europe, fewer than half view China positively. Majorities in Germany (61%) and France (59%) give China an unfavorable rating. Elsewhere in Western Europe, China’s image has worsened in Britain, making it at par with 2008 levels. Spain is the only Western European country surveyed where views of China have improved steadily since 2008. While only 31% of the respondents evaluated China in a positive light in 2008, this number increased to four-in-ten in 2009 and now stands at nearly half (47%). China receives high marks from both African countries surveyed; 86% of Kenyans and three-fourths of Nigerians have a favorable opinion. Russians also remain largely positive towards China (60%), as do majorities in Middle Eastern countries. In Asia, strong majorities view China positively in Pakistan (85%) and Indonesia (58%). Among China’s BRIC (Brazil, Russia, India and China) counterparts, Indians remain the most negative in their views of China. Slightly more than one-third (34%) of Indians view China favorably, a significant decline since 2009, when nearly half (46%) said the same. Few in Japan and South Korea view China in a positive light. Only 38% of South Koreans and slightly more than one-quarter (26%) among the Japanese say that they have a favorable view of China. In fact, among the countries surveyed, Japan is the most likely to view China unfavorably (69%). While majorities in the U.S. and Western Europe consider China neither a partner nor an enemy, large majorities among African countries, as well as sizeable numbers in the three Latin American countries polled, view China as a partner. More than half of the respondents in the U.S. (52%), Spain (53%) and Germany (55%) and roughly seven-in-ten in Britain (71%) and France (70%) see China as neither a partner nor an enemy. Even though only one-quarter of Americans see China as a partner, this reflects a 12-percentage-point increase since 2008, when the question was last asked. Consistent with their positive views of China, strong majorities in both African countries surveyed are likely to see China as a partner, including 84% in Kenya and 75% in Nigeria. Meanwhile, in Latin America, more than four-in-ten Brazilians (45%), Argentines (42%) and Mexicans (42%) hold this view. China is also considered a partner in Pakistan (84%) and Indonesia (54%). Other Asian countries, however, are more wary of China. Indians are the most likely among the countries surveyed to consider China an enemy (44%) and only 32% consider the country a partner. In fact, Indians have become more distrustful of China since 2009, when more than four-in-ten (43%) saw the country as a partner. In South Korea as well, more than one-third consider China an enemy (35%), although a roughly similar proportion do not consider China either an enemy or a partner (38%). While only 32% of the respondents in Japan consider China a partner, this reflects a significant increase since 2009, when less than one-quarter (23%) saw China in this positive role. Among the Middle Eastern countries surveyed, respondents in Jordan are the most likely to consider China a partner (47%). 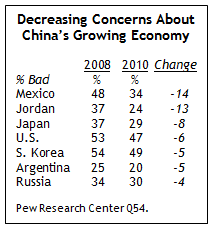 Concerns about China’s economic might are high among publics in the U.S. and Europe. In most of these countries, majorities or pluralities consider China’s growing economy a bad thing for their countries. Respondents in France are the most likely of all the countries surveyed to be concerned about China’s economic prowess (67%). In Britain, the public is divided on this issue, while in Russia, a plurality think China’s growing economy is a good thing for their country (49%). about China’s growth, while opinions are divided in South Korea. Concern about China’s growing economy has declined in seven of 21 countries surveyed. In Mexico, nearly half evaluated Chinese economic might as a bad thing for their country in 2008, compared with roughly one-third (34%) now. A similar drop is seen in Jordan, with somewhat smaller declines in Japan, South Korea, the U.S., Argentina and Russia. In some countries, however, there is now greater concern about China’s economic power. For example, a majority of Indians (56%) now say that China’s growing economy is a bad thing for their country and just 34% say it is a good thing. In 2008, opinions were nearly evenly split; 45% of Indians were concerned about China’s economic growth and 42% were not. With few exceptions, the publics in this survey worry about China’s growing military might. Consistent with their overall views of China, Japan and South Korea remain among the most likely to evaluate China’s growing military might as a bad thing for their countries (88% and 86% respectively). The French are also similarly concerned (87%). In India, a nation that fought a brief war with China in the early 1960s, concern about China’s military strength stands at more than six-in-ten (64%). Large majorities in Europe and the U.S. have a negative view about China’s growing military prowess. Yet, publics in a few countries surveyed widely consider China’s military growth a good thing for their countries. Pakistanis, who have benefited from the acquisition of Chinese arms and military technology in the past, are among the most positive: 70% consider China’s growing military might a good thing. Opinions about China’s military strength are also positive in the African countries surveyed. More than six-in-ten among both Kenyans (66%) and Nigerians (64%) think that China’s growing military strength is a good thing for their country. Chinese views of the U.S. are largely positive. Chinese respondents widely believe that relations between the two countries have improved. Chinese respondents are also likely to see the relationship between their country and the U.S. as one of cooperation. 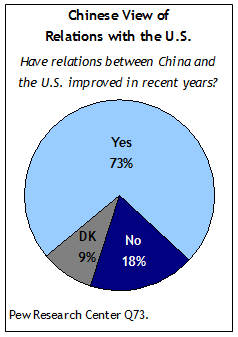 More than seven-in-ten (73%) Chinese say that relations with the U.S. have improved in recent years, while only 18% think that relations have not improved. A majority of Chinese also have a positive view of the U.S. (58%). By contrast, fewer than half of Americans have a positive view of China (49%). Further, a wide majority of Chinese (68%) considers the relationship between the two countries as one of cooperation, while only 8% evaluate it as one of hostility.